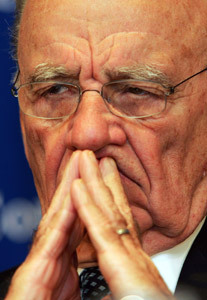 The American Society of Newspaper Editors has selected Rupert Murdoch as a speaker at its annual conference, to be held in <?xml:namespace prefix = st1 ns = "urn:schemas-microsoft-com:office:smarttags" />Washington April 12-15. “We think he would be an interesting person to speak to the group," said ASNE executive director Scott Bosely. We ourselves think the Q&A part in particular could be interesting, even exciting. To help out, NiemanWatchdog.org is asking: Got any questions for the mogul who controls the News Corp, Fox Broadcasting Co., British Sky Broadcasting, more than 20 Fox TV stations, and newspapers, magazines and book publishing firms on several continents, among other holdings? If so, let’s have ‘em — anyone can get in the act. The best way to submit questions is to post them as a comment to this article. Or you can e-mail them to: editor@niemanwatchdog.org. Please include your name, hometown, and affiliation, if relevant. Later on, we’ll pick what we feel are the dozen best questions, and we’ll make sure they get in the hands of editors who’ll be there to ask them of Murdoch, if they choose. Q. Do your news organizations have written codes or standards of ethical conduct for reporters and editors and, separately, for commentators, and if they do, do you make them available on request to the public? Q. What processes do you or the leaders of your news organizations have in place to address complaints of bias, dishonesty, unfairness, and conflict of interest made against editors, reporters and commentators in your news organizations? Q. Have you or the leaders of your news organizations reprimanded or disciplined commentators, editors or reporters for bias, dishonesty, unfairness, and conflict of interest, and will you cite specific cases in which reprimands were issued or discipline was imposed? Q. Do your news organizations and commentators give equal exposure and treatment to people and organizations they describe as "liberal" and people and organizations they describe as "conservative"? If not, why not? Q. Major news organizations including the New York Times and Washington Post regularly publish investigative reports that expose grave wrongdoing by federal officials and agencies in the current and past administrations and of criminal and grave misconduct by corporations. Have your news organizations done investigative reporting either of grave wrongdoing by federal officials and agencies during the current or previous Republican administrations, or of criminal and grave corporate misconduct? Have you ever asked yourself whether you have abused your media power?